Tillandsia circinnata hort. sensu Mez & auct. non Schltdl. Origin and Habitat: Florida, the Bahamas (on all island groups), the entire Caribbean region, Mexico,Colombia an Venezuela. Altitude range: from near sea level to 1500 metres above sea level. Habitat: It grows on either dead or living shrubs and trees in semiarid regions, wetlands and Dry Broadleaf Evergreen Formation – Shrublands (scrublands). It is also commonly found buttonwood trees in the coastal mangrove belt and in cypress (Taxodium ascendens) crown colonies across southern Florida. Description: The popular and widely grown, Tillandsia circinnata of horticulture (here described) is NOT the same Tillandsia circinnata descibed by Schlechtendal on 1845. 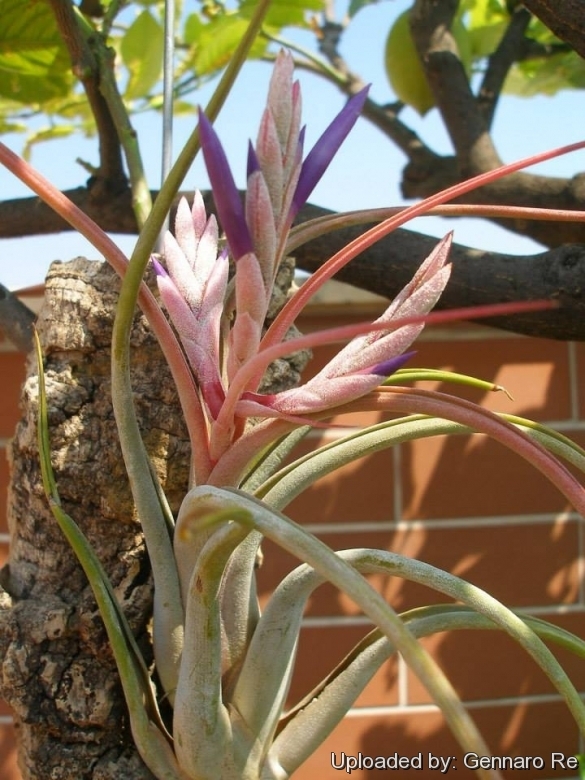 In 1982, Wilhelm Weber published an article in the Journal of the Bromeliad Society that showed that the type specimen of Tillandsia circinnata of Schlechtendal was actually the same as Tillandsia streptophylla. Conversely the valid epithet for the “Tillandsia circinnata” of horticulture (described by Mez in Bromeliaceae 1935 and by later authors) correspond to Tillandsia paucifolia Backer 1878. Anyway (whatever the scientific name is) this easy to grow urn-shaped tillandsia is highly priced for its stiff, silvery, strongly contorted leaves coiling around a pseudo-bulb (onion-like mass). The entire plant is covered in silvery scurf, with hints of green and pastels when wet. When in bloom, the upper portion of the plant often becomes erubescent (rosy), which enhances the mauve or blue colour of the long, tubular flowers. It resembles a narrow version of Tillandsia caput-medusae. Habit: It usually grows in a cluster of two or three rosettes form small pseudobulbs, but occasionally may forms larger clumps with up to 12 heads. The offshoots or pups, often grow at right angles to the parent plant like spokes on a wheel, even growning downward. An average mature rosette is about 15 cm wide and 18 cm in height. Stem: Very short, not discernible. Leaves: Thickened, covered with brownish grey scales, strongly recurved, with an entire margin and acuminate leaf apex, to 20 (or more) cm in length. The leaves do not exceed the length of the inflorescence, and the outer leaves often do not have blades (only leaf sheaths). The leaf bases are ovate, acute, 1.5-3 cm. long with enlarged leaf sheaths which quickly meld into the leaves, and very convex but only loosely arranged and in great number, they form a type of dense, tight pseudobulb, which gets to 12 cm in length and 3-5 cm acros or even greater size by virtue of the fact that the leaf surfaces are curled inward and variously twisted or even spiraled, almost like tendrils. Flowers: Actinomorphic, long, tubular, arranged in multi-branched inflorescence, each subtended by a bract. The pink bracts are linear to ovate with an acute or apiculate apex and exceed the length of the calyx. There are 3 green unfused sepals in the calyx. There are 3 pinkish purple petals in the corolla. There are 6 stamens that are longer than the petals. The ovary is superior with 3 locules and numerous seeds. Both stamens and style are exerted from the flower. Seeds: Each seed has a tuft of hair to assist in dispersal. Tillandsia circinnata hort. sensu Mez & auct. non Schltdl. : The common “Tillandsia circinnata” of horticulture correspond to Tillandsia paucifolia Backer 1878. Cultivation and Propagation: The pot bellied airplant Tillandsia circinnata (syn: Tillandsia paucifolia) is a slow-growing bulbous variety and perhaps one of the easiest to grow, requiring only bright light and controlled watering to prevent constant wetness. It is drought tolerant, and will thrive within a broad latitude of care conditions. Anchor it as a hanging basket specimen or is simply hung it by a piece of wire and allows it to do its thing. Outdoors grow the air plant nestled in the highest reaches of a tree where it will receive very bright light and excellent air circulation. Growth rate: It grows slowly, often needing two growing seasons to reach maturity. It produces a substantial root system and responds to good cultivation. If one has patience, a large clump can be produced in a few years.